Michael Sheen as David Frost interviews Frank Langella as Richard Nixon. 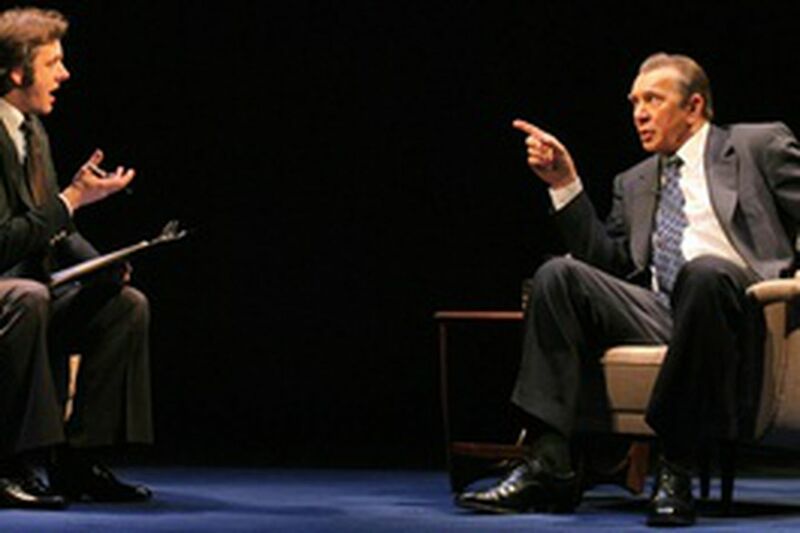 The play recalls Frost's interview with Nixon after Watergate, which drew the largest audience for an interview in TV history. NEW YORK - When Richard M. Nixon, the 37th president, resigned in disgrace in 1974 after deciding that an impending impeachment procedure for obstruction of justice would be even worse than bailing out, he didn't grovel. Or even apologize. He stood firm. He was doing what was best for the presidency, he said. Three years later, in what attracted the largest audience for a television interview in history, British talk-show host David Frost finally got Nixon to assess his role in the scandal that wrecked his presidency, Watergate. The unlikelihood of Frost's success is laid out at the start of Frost/Nixon, which opened last night on Broadway - a muscular, engrossing first stage play by Peter Morgan, who wrote the movie The Queen. Frost - played by another Queen alumnus, Michael Sheen, in a performance that equals his masterful portrayal of Prime Minister Tony Blair - rashly asks for an interview with "a rather big fish that swims in not untricky waters," as he tells his longtime TV producer. The producer is visibly horrified at the prospect. "C'mon," Frost says, "don't look like that." "How do you expect me to look?" the producer asks. "I spent yesterday evening watching you interview the Bee Gees." The play, whose energy bounds from the stage under Michael Grandage's direction, is all the more remarkable for Frank Langella's vital portrayal of Nixon that nails the man's cadence, dialect and general presence - and, most important, highlights the flesh-and-blood guy who came through on the actual interviews. (To see about 10 minutes of the real interviews, check out http://youtube.com/watch?v=lJs80eBGYlM.). Langella, a two-time Tony winner equally at home on a sound stage (Diary of a Mad Housewife, Dracula), teamed with Sheen on the London stage, where Frost/Nixon ended a run in February. When they reenact segments of the interviews, the scenes seem as real as the interviews themselves; the rest of the time, the two-hour play whips by in one act, personably narrated by Stephen Kunken, who plays academic Jim Reston, who advised Frost on the interviews. Frost/Nixon traces two dilemmas: Frost - now, Sir David Frost - is an entertaining, party-boy patter-master who has a lot to lose if he bollixes his role as Nixon's official TV interrogator. For his part, Nixon's stonewalled defenses will crack unless he controls the conversation. Softballs could end Frost's career; hardballs could smash Nixon's best hopes for restoring a reputation. Morgan's arresting play captures the moment, the era - and the audience. By aiming its stage lights on the two men, Frost/Nixon illuminates history. In the process, we are brighter. Written by Peter Morgan, directed by Michael Grandage, sets and costumes by Christopher Oram, lighting by Neil Austin, sound by Adam Cork. The cast: Michael Sheen (David Frost), Frank Langella (Richard Nixon), Stephen Kunken (Jim Reston), Corey Johnson (Jack Brennan), Sonya Walger (Caroline Cushing), Remy Auberjonois (John Birt), Triney Sandoval (Manolo Sanchez), Stephen Rowe (Swifty Lazar, Mike Wallace). Playing at the Jacobs Theatre, 242 w. 45TH St., New York. Tickets: $76.25 and $96.25. Information: 1-800-432-7250 or www.frostnixononbroadway.com. Contact staff writer Howard Shapiro at 215-854-5727 or hshapiro@phillynews.com.